I kept meaning to throw some pictures up here on GM and life got a little hectic. My boyfriend and I found Cas wandering his neighborhood a month or so ago and took him in. Look Mom! I'm adorable! And I've stolen this Build a Bear bed for my own! You don't mind, do you? Dad what are you doing with that strange thing and why are you pointing it at me....can i have this? Hooman, why did you pick me up out of the rain? I was playing in the puddles! I like this blanket that heats up! I'm going to stay here forever! OH! Found a photo of his grumpy face during bath time. He is sooooo not fond of baths and yet insists on digging in the water dish in order to soak his belly. 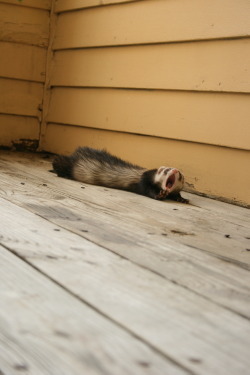 *rolls eyes* Ferrets. He is absolutely gorgeous Congrats on the new addition!! 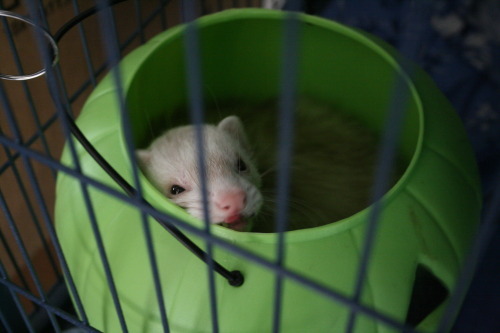 Re: Cassiel, The Stray - now with moar ferrets! 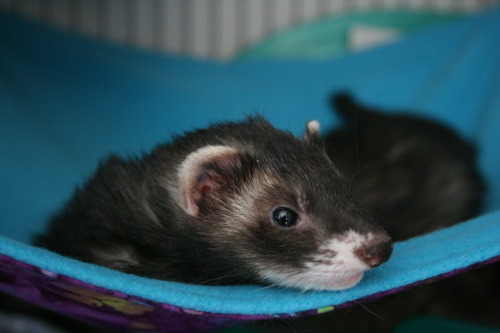 I forgot I had a thread for my ferrets! 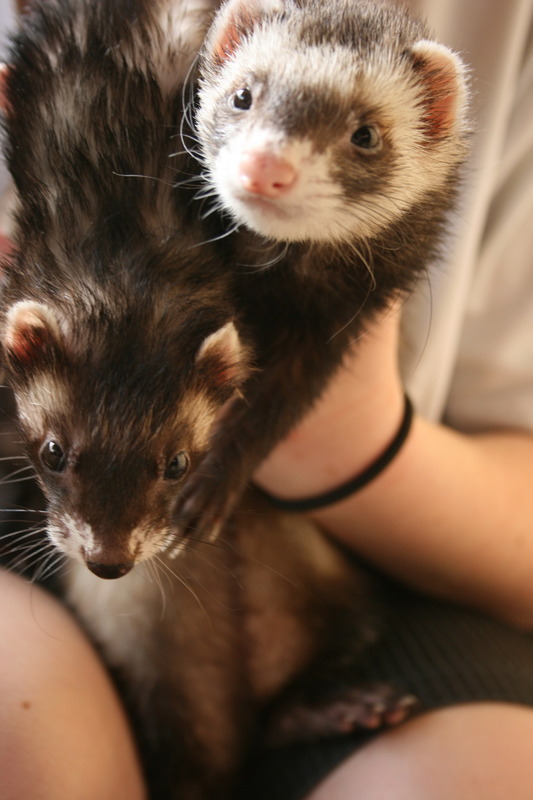 Since we've adopted Cas, we've also adopted 2 more ferrets, Tek & Ra. From left to right, Cas, Ra, Tek. Cas modeling the new cage we had gotten and the boyfriend repainted for me. I don't have any new pictures of my buisness right now but wanted to do a quick update anyways. Cas & Tek will be two next month and Ra will be one. At least that's what I'm saying. Tek is the only with a birth certificate so I have to guesstimate their ages. All will be getting a birthday present of shots! 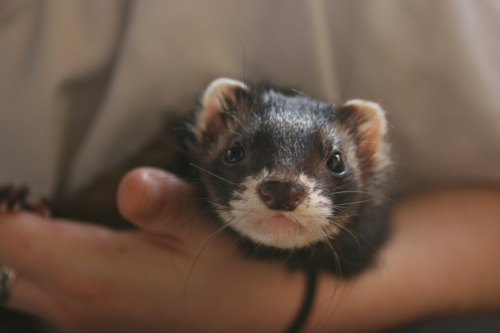 I'm considering entering Cas into a ferret show in June but haven't made up my mind yet. 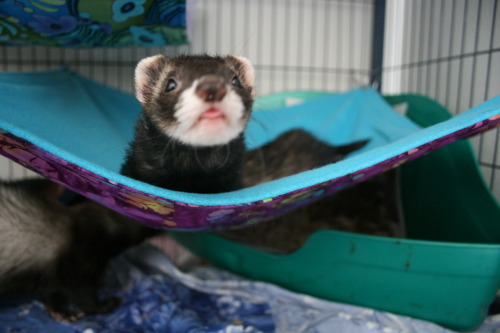 Cassiel is the easiest ferret to work with for pictures which is why I have so many. We're moving though and there's a nice fenced in dog park, so hopefully I can get some of everyone out in the sun with their spring coats soon. This little girl came to us through our vet. Her cage mate passed last week and her owners wanted to rehome her to someone who had ferrets already and my vet thought of us! So we did introductions at the vet and we pretty much fell in love instantly. She walks a little funny, is a little skinny, and has a wonky tail, but is bright eyed and even dooked and played a few hours after come home with us. We don't have a name (and I forgot to ask about her previous one) but we're thinking something related to bears. I've considered adding a third but I'm undecided. Is there a big difference in care/cleaning with more than 2? No, I wouldn't say so. We really noticed the difference when we jumped up to 4. But this may have also been because our 3rd is a tiny neurotic female who doesn't eat much. She's very independent too. 2 is a great number, 3 is even better if you can get a good personality fit. It also means everyone will have a partner when someone passes. I know what you mean. Penny doesn't eat much but LD is a pig. The main reason I am considering a third is because Penny is very independent and wants to go off to do her own thing. LD is a little cuddley social butterfly. They get along well but penny gets somewhat annoyed like an older sister would with her tag along little brother. It sounds like a third cuddly bub would be a perfect fit for you! Cas is very much into cuddling and playing while Tek is somewhat independent. He gets to cuddle with me and my bf but Lil' Bear gives him lots of cuddling time too. I think the key is really just finding that right kind of personality. May or may not be procrastinating from homework by updating this thread. Lil' Bear, as she is now known, is a complete doll and keeps opening up every single day. She's recently figured out that it's okay to war dance towards/at us although she doesn't quite understand how to play /with/ us just yet.